Stressed spelled backwards is desserts. Coincidence? We think not! Come relax with us and complete your meal with one of our mouth-watering desserts. Our “postres” menu is loaded with Deep Fried Ice Cream, traditional Churros and many other satisfying treats for your sweet-tooth. Deep Fried Ice Cream – A mound of creamy vanilla ice cream in a crispy cinnamon-sprinkled crust, topped with whipped cream and chocolate syrup. Sopapillas – Two deep-fried pastries topped with cinnamon sugar and served with a scoop of vanilla ice cream. 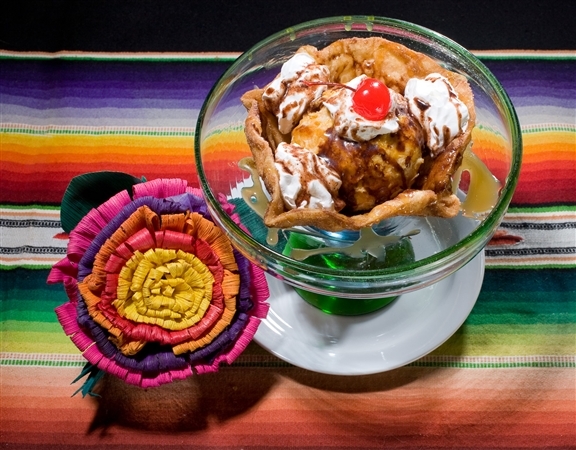 Buñuelo & Ice Cream – A crispy flour tortilla smothered with melted butter and cinnamon sugar, topped with vanilla ice cream and whipped cream. Flan – Traditional Mexican-style custard with a delicious caramel sauce. Churros – Golden fried churros dusted with cinnamon sugar and topped with whipped cream. There is always room for dessert here at Casa Guadalajara! This entry was posted by The Guadalajaran on July 25, 2014 at 6:07 pm, and is filed under Blog Entries. Follow any responses to this post through RSS 2.0. You can leave a response or trackback from your own site.